The foothold of the great Tagore family, Jorasanko Thakur Bari or Rabindra Bharati Museum is a witness to major historical turning points in modern Bengali history. 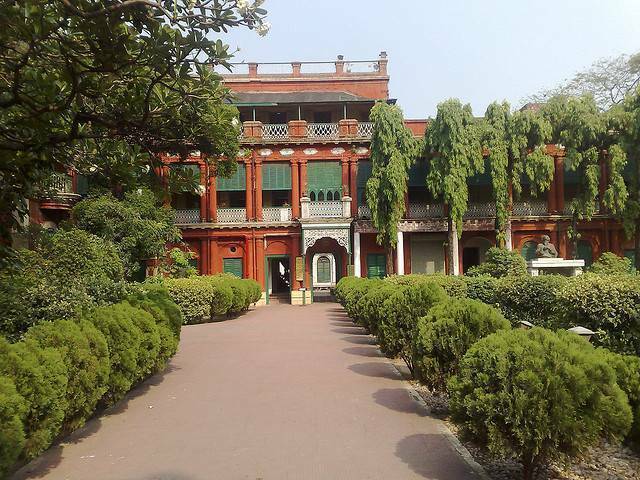 Presently situated within the premise of the Rabindra Bharati University in North Kolkata, this house was constructed by the fountain head of the Thakur family, Prince Dwarkanath Tagore and over-the-top flamboyance defined every aspect of his life which clearly comes across when you visit the place. This house saw the convertion of Brahmoism into a religion under the auspices of the Kaviguru's father Debendranath Thakur, this house saw the Bengali Bard at his best, this house bears witness to the creation of fashion statements by the women in the family that created a stir throughout the elite society of the city and this house has seen what it means to be close to the great Rabindranath Tagore during the massive Bengali Renaissance. The museum constructed, beautifully replicates the lifestyle of the Tagores and gives you a feeling of the city as it existed throughout the reign of Queen Victoria. You must make it a point to pay a visit to this place and if possible schedule it on the 8th of May or 7th of August, the birth and death anniversary of Tagore when the university organizes grand functions in honour of the Bard. Composing dance dramas to writing poetry, this man did it all and to get a taste of his legacy, this is where you should come.